What better way to remember the beloved inventor of this fictional system, then, than “GNU Terry Pratchett”? Reddit users have designed a code that anyone with basic webcoding knowledge can embed into their own websites(anyone without basic webcoding knowledge can use the plugins for WordPress and other platforms). 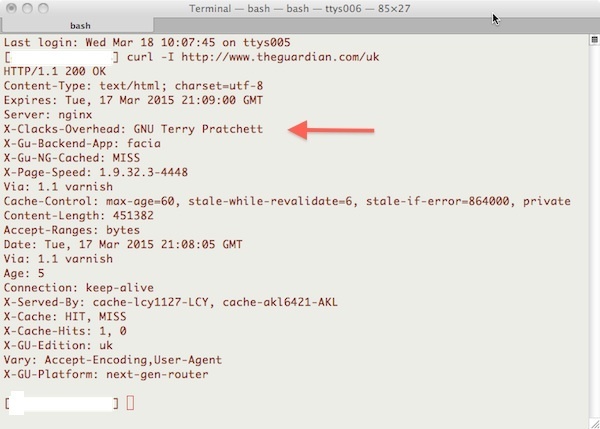 The code is called the XClacksOverhead, and it sets a header reading “GNU Terry Pratchett”. “If you had to be dead,” thinks a character in Going Postal, “it seemed a lot better to spend your time flying between the towers than lying underground.” And so Pratchett is, in a way. Here’s how Apple Mac users can see it for themselves. Basically we want to show the HTTP header contents for the webpage. Open Terminal – this application lives in the Applications > Utilities folder. * As there may be money involved, that’s unlikely I suspect.